Q1. Dasaji, who is the founder of Foundation For World Awakening and can you tell us about his background? Ans. Sure. The founders of this Spiritual Institution are Sri Mukteshwar Bhagavan or as his followers would lovingly call him Bhagavan and his spouse Amma. They founded this movement in the year 1989 and then trained a band of his disciples. Today his disciples are 130 in Number and they are called as Dasas. About Bhagavan personally, he was born in the year 1949, March 7, in the state of Tamil Nadu, India. Bhagavan all along his life has been concern about Man, ever since his child hood from 6 yrs of age. All his life his concern has been the Enlightenment of Man and his suffering. Bhagavan knew that this state (Enlightenment) Man couldn’t achieve on his own. Except for a few people who had done very great sadhanas, meaning very great work & meditations in their previous life, the rest of man kind, the ordinary man whom we see today cannot make it on his own. In spite of his reading various books, reading psychology, and different philosophies he knows & whatever meditation he might do. So Bhagavan always felt that this state must be given to Man. And ever since Bhagavan was 6 yrs. old this has been Bhagavan’s Vision & Mission in his life for Man. Finally when he was 40 yrs. old Bhagavan chose to reveal to Man as to who he was. And when he did revealed he did not come physically and say that I am an avatar. The way it happened was suddenly at this Jeevashram Campus, a school founded by Amma & Bhagavan, which today is called Satyalok that the divine phenomenon broke out. Different students began to have divine experiences about Bhagavan where Bhagavan began to manifest with in them. Children who have no inclination towards spirituality what so ever began to have mystical experiences and they could reveal when it came upon them. This phenomenon initially broke through Bhagavan’s own son, Krishna ji. It broke loose there and later it came to the other students. It just happened spontaneously that Bhagavan manifested within Krishna ji and from there Bhagavan moved out to others where children began to move to altered state of consciousness, they used to see divine beings, have thundering revelations about universe, its natures, its laws, and they also had death experiences. These were people who were studying 9 Th, 10 Th grade. Children studying 2 nd or 3 rd grade used to go astrals to their homes and see what their parents were doing and come back. All that they would do is to sit in front of him & feel the connectedness with them and say I want to see my parents. Even as they would ask it happen to them. This is how the phenomenon broke loose and then Bhagavan with drew it and started giving steadily & gradually in a more organized way to the Humanity because Bhagavan felt that the society was not yet ready for it. This is when we began to conduct the spiritual retreats where these experiences were given to people. A thorough cleansing was done to them before it was given to the parents, elders, etc. of the children. Q2. To understand His teaching can you explain briefly the main purpose of the teachings and the Aim of this Institution that you said was Enlightenment? Can you get to that area in detail? Ans. How would you like the details to be? Q3. Like you mentioned that His Mission is to Enlighten Man, so how is he preceding his teachings in a certain order to the public to get them to that state? Because it is such a difficult state they say and not an easy state as you said only few people has made it. But you are saying that he can do some thing that no Avatar has done it before. Are you saying that? Ans. Yes. This Institution called Foundation for World Awakening as know in the west and Bhagavad Dharma as known in India has got two sides to it. On one side it is the Empirical side where there are teachings. It is Insight and understanding oriented. It is where the teachings of Bhagavan would liberate Man from the clutches of His Mind. The second part is mystical and revelatory. This part of the Dharma has got nothing to do with understanding & Intelligence. It has to do basically with your heart. It is basically where the individual or seeker who is seeking for Enlightenment is sitting in front of Bhagavan and tunes his Consciousness with Bhagavan’s Consciousness and then the whole phenomenon begins to happen to him. The first thing that happens to him is that Bhagavan awakens within Him as the Inner Dweller or Antaryamin, as the higher sacred Self, the divine within him. 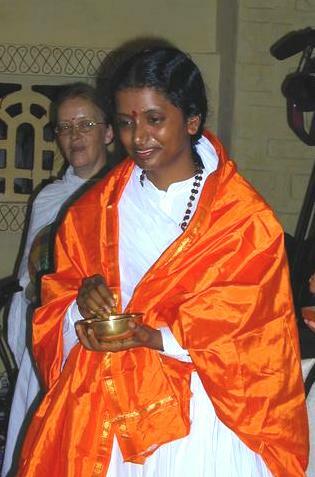 Once the Antaryamin is activated in any form within you, the form of Bhagavan, Jesus, Mary, Divine Light, Silence, or any form, then the Journey begins and the process of cleansing that occurs, the cleansing of the negative effects (Samskaras) of your past lives, from the conception, during your mother’s womb, during your birth, through this life and this process it is not some thing that is only psychological, but also mystical, emotional and finally it is biological. Bhagavan comes into them and does some thing to their physical body though nothing happens to them outside, but then he performs some thing psychically and it affects your DNA and suddenly you realize that you are in an altered state of Consciousness. The functioning of your Mind is different. It is silent and listening to the sound of the bird. You do not know the meaning of suffering one fine morning. The whole thing could take place within 7 minutes, 7 days or 7 months but then you suddenly land into the state and you know it has not happened through your effort. It is a happening to you. It is a gift that is given to you. In Bhagavan Dharma whatever approach we take, we might approach to begin with the problem of the person in the mundane world. For Instance, some one is having financial crises. We might take a spiritual approach and with Bhagavan’s Grace we solve the problem. Or we might approach a person with relation ship problems, may be with spouse, child, friend, etc. Or a person a bugged with certain fundamental questions about life, nature & structure of the Universe, we approach those. All of these we approach with a single intent of Enlightenment and altering the human Consciousness. That basically is Bhagavad Dharma’s approach and this is the way Bhagavad Dharma precedes. Q4. In India, in this spiritual Institution what do you call these teachings or your programs? Ans. In India we call them yagnas. There are different kinds of Yagnas we do for different purposes. 1. We do some yagnas for the old, sick and those who are about to die. They actually have an experience of death even before they are dead. It is basically they know what is going to happen as they die & even after they death. Here the process of dying is revealed to them mystically and they are also taught about the easiest way to pass away, the beautiful way to die, and the way to breathe & hold their consciousness and how beautiful would it be so beautiful to die. This we call Moksha Yagna. It is where the cycle of birth and death come to an end, where you do not come back again, you go to the higher worlds (lokas). 2. We also do yagnas for the youth. Most of the youth are caught up in tremendous suffering, dissatisfaction in life and do not know what to do and make of their life. In this dissatisfaction almost across the globe you see youth going berserk, taking drugs, running across the world trying to seek some happiness that always seem to be so illusive and not able to get up. We conduct Retreats for the youth. In these retreats most of them transcend their psychological suffering, spiritual suffering & discover a greater purpose to life. They become also successful and achieve things in life. 3. We also have retreats at the first level basically for people who are seeking for solutions for their sufferings. People who want their problems to be solved that are not able to tolerate in their lives and it is throwing on to them. We work on their internal transformation, which would eventually result in outward transformation. The word “YAGNA” means- a sacrifice; To the Ancient Man the whole universe was nothing but a sacrifice. That is you give some thing and some thing will come out of it. For instance, you take food, it dies within you, and it burns in the fire of digestion and gives you energy, the life energy. The Ancient Man knew that the whole Universe is the process of- “You give some thing and you get back some thing”. Life leading to death and death to life. A Yagna is a place where you sacrifice some thing and here the sacrifice is “Your effort & passion to transform your self”. These are spiritual sacrifices that people do in these yagnas or Spiritual offerings. This is how we address in India. Q5. What is exactly Enlightenment in your teachings? Can you give more details about this? Ans. Enlightenment in Bhagavad Dharma is spoken at 3 levels. At first level it is experiencing reality as it is. That is where the Mind doesn’t interfere with your experience. Today we know today what is happening within us. You are looking at the world; you are actually not looking at it. What is happening within you is a lot ceaseless chatter going on. Continuous talk, interference from the past, day dreaming about the future; Very rarely are you looking at the birds as it is, looking at the face of the child as it is. People do not experience reality as it is. So at the first stage, Enlightenment is where the interference of the mind stops and the senses are alive. At the second stage Enlightenment is feeling a tremendous sense of connectedness with the world around you. You feel connectedness with the plant, with the human being in front of you, with the animal, with the mat on which you are sitting, to the sky, you feel connected to every thing around you. You don’t feel that you are alone and don’t feel the sense of separate existence, which basically is the curse of man. At the third stage Enlightenment is where you experience oneness with the universe. It is no more a sense of connectedness instead you experience a complete union with the universe. You experience Cosmic Consciousness. This is what the Ancient sears would call it Aham Bramhasmin. That is I am this whole process called the Universe. In Bhagavad Dharma, Bhagavan gives people these different kinds of states and these states that the people land into is not because of a psychological gimmick that they do with them selves, not a game that they play with their mind, not another kind of perception that they would have with which they view the world. It has no effort but just has to happen to them. And this happening Bhagavan says can take place only when some thing fundamentally different happens to you in your brain cells. Now we know that there are 2 hemispheres in the brain, left & the right. Not all people are mystical. If some body has to be a mystic, then a different kind of electricity has to flow in his brain cells in a particular pattern. Only such of these people have mystical experiences and not others. Now Bhagavan says when he performs a psychic surgery to you and do some thing to you psychically, electrical impulses are sent into a certain small part in your left hemisphere of the brain and when these electric currents go to that part of the brain then naturally the way you experience reality would be different. That is how it has happened to all the previous sages and saints and mystics of the past, though some people were unaware of it. Now Bhagavan is making it happen to any body that is serious and seeking for it. And before this they are taken through a process and finally when their consciousness gets connected to Bhagavan’s consciousness then this is what happens to people. This is how all people land into this state. Q6. In what respect will it do for me in my life. How does Enlightenment help in my day-to-day living? Why must one be enlightened? People have talked about Enlightenment of Buddha and other great masters of the world? Why do it for mankind? Ans. Well, Enlightenment as Bhagavan gives it to Man, is not just for you. It is for you and through you for the rest of the world. And why at all do we need this state itself, Cannot man go on living in the state, which he has been living for hundreds and thousands of years. The first thing that will happen to you the moment you are Enlightened is you’ll have to search in dictionary for the meaning of the word suffering. The second thing that will happen to you is a tremendous flowering of the heart where you’ll begin to discover love and it is for this love that most of us are aching in life. Today all human beings basically are trying to live for them selves and there fore it has become a world where I live for my self and you live for yourself and finally no body is there to care for each other. It has become a love less world, a desert. If this situation has to change, Bhagavan says cultivated love is virtues ones, but it some thing that has to happen to you. You can’t pump love into your heart. So the second most beautiful miracle that will happen to you in your life is this discovery of love & compassion in your own life. For a person who is Enlightened he has no suffering in his life, therefore he also does not create suffering for the rest of the world. In his life the psychological & spiritual suffering ceases forever. And also such those physical problems that are arising in our day-to-day life, which are basically arising because of our wrong thinking patterns, the way our mind is structured, and the negative merits that we are acquiring through our thought, word and deed, all these would come to an end in the life of a person who is enlightened. If you look at the world you find that happy person gives happiness to others and such of those people who are constantly mad at others, hurt others, curse others are the ones who are themselves suffering within. No happy person can give unhappiness to another and No unhappy person can give happiness to another and Love is not something that can take side in an unhappy person. By your Enlightenment you are saving society from there. A human being who is suffering is a danger to the world he is living in. So when you are Enlightened not only have you acquired a state of bliss & joy but you are also helping the rest of the mankind live in peace. That is the first thing you’ll have to do. A person who is enlightened would naturally know how to develop his child, would naturally know how to help his friend who is in crises, how to share his life with his spouse. These are things that would naturally come to him. An Enlightened person in a house, his consciousness would be affecting his family, office colleagues, work place, town, city, and it is the greatest bliss that can happen to any body, to have an enlightened being in ones place and that the foundation is giving to mankind. I think any body should run for it now. Q7. Ok but the foundation work is to awaken the whole world. Is your main purpose to have the whole world Enlightened? Ans. obviously yes it is. It is history. Man in his natural state in Enlightened. That is how he is supposed to be and that’s how they are made and that is why our left cerebral cortex that part of the brain has space where by we can get in touch with the Cosmic Consciousness. But then owing to certain factors man has lost that state. Bhagavan is trying to give back that state to man, this state of Enlightenment to all of humanity. These factors are- in this Cosmos there are several planets & planes where there is life and life is beautiful. Only in very few places things are going wrong as it is going wrong with the earth. To put it short and in a way to understand, the earth is moving in its axis and there is a star called Mulam. From this star there is cosmic radiations emanating and it falls on the earth. When ever that happens the DNA of the man functions differently and man naturally is in a different state. His senses and mind functions differently, and the mystical dimension opens up. Whenever this cosmic radiations are not received by the earth because of its revolution and the axis in which it is moving, then man’s consciousness becomes dull, the mystical dimension closes, he becomes more a physical human being. Right now at this point of time the earth is receiving the radiations from this star Mulam. The Cosmic energy is flowing on to this planet. And at this time to make this enlightenment happen to man Bhagavan has come down, to make this process happen to man so that man again shouldn’t miss this opportunity. Bhagavan has come to alter the DNA of man and that is what we are doing here. Q8. Dasaji what is the plan for the global Enlightenment of mankind, its reason and purpose? Ans. People sometimes ask me- can the whole world participate in these retreats and the whole world go through this process and how long would it take. The answer to this question would be- we do not want the whole world to be here. Bhagavan says that if 60,000 people from across the globe came and participate in the process of Mukthi Yagna, went through this whole process of cleansing and if they did their meditations, on them the Monks (dasas) of satyaloka work on them psychically & mystically and they entered into a state of Enlightenment then Bhagavan says for the rest of the mankind it is automatic. It is only this small percentage that we want. If 60,000 people are going to become enlightened then for the rest of mankind it is automatic. We, the Foundation For World Awakening are here to awaken this 60,000 people. Then one fine day some body would get up and he is enlightened and a person in Africa gets up in the morning enlightened. In New York some body getting down the bus would be enlightened. That is how it is going to happen after we cross the number 60,000. Then these 60,000 people who got this state as they touch they can transfer the state to others, as they look they can transfer the state to others. Actually the state of Enlightenment, which is the natural state of man, when a child is born he is enlightened. Its mind is not chattering. It doesn’t know to suffer. Some where around age 2- 21/2 yrs. the self is born, this feeling of separate existence and then begins suffering at of human being. According to the plan of Cosmic Consciousness or nature as you call, man is supposed to loose the sense of separate existence by the time he is 18- 21 yrs old. By the time he is 21 every human being is supposed to be enlightened. That’s why the moment you are 15 and 16, a tremendous spiritual dissatisfaction begins, a dissatisfaction that has no cause. You are trying to satisfy yourself and it doesn’t seem to fill your heart. You always seem to feel that some thing is lacking and some thing that needs to be done. This is how it had to be. Now Bhagavan by the power of his consciousness and by himself going very deep into human Consciousness is making this happen in this Mukthi Yagna where people are getting in to this state naturally and the moment we cross the number 60,000, its done. From India we are expecting 30,000 people to go into this state because in India there are already thousands of people who are acing for this state. In fact we prepared them sufficiently for past 5 years for this state and in this land enlightenment is some thing that has been there. The sages and saints have tilled this land across thousands of years for Enlightenment and from the rest of the world we are expecting another 30,000 people. We know that there are people across the globe who are seeking for this, who want to end their own suffering as also end man’s suffering. We want these sincere & serious people for the Yagna. Also right now in these Mukthi Yagnas we are training people from different countries & continents who will get back to their nations and Bhagavan gives these enlightened people some special powers so that they get back and help their people. They search for sincere spiritual seekers and prepare them sufficiently before they can come here to India for their final Enlightenment. That is the plan right now. Q9. Is there a schedule for these 60,000 to attain enlightenment and how many did Bhagavan help get ready and how many got enlightened in India and around the world? Ans. I have not been in touch with the rest of the world as I have been basically working in India. I know there are few South Americans who are enlightened already. In India we have conducted six retreats so far in the past 3 months. Each of these retreats had about 150 people. As I know till date there are about 250 people who made it into this state, the others are having this enlightened state on and off coming and going and few others are clearly walking on the path. Very few people who have not made it and not had the taste of that state also because these are those people who are not really keen on enlightenment as they are caught up in their problems. Any body that is serious will either have an immediate taste of the state or would land into that state. In India right now, in just 3 south Indian states there are about 8500 people as on date waiting for it and more seekers are continuously coming in. We are having hard time selecting them. Every time the dasa of the place has to tell the people because right now we do not have the facility to take that amount of people. We can right now only accommodate 150 per month. Very soon we will be having it because we are in the process of expanding. Q10. Is there a time as how long are these mukthi Yagnas and how often are they for different people in the world. Is there a schedule? Ans. Definitely. These Mukthi Yagnas lasts any where between 11-15 days. During these days of very intense spiritual retreat people are asked to maintain silence. They go through an austere process of living. The retreat is divided into 2 parts. One part is called Samskara Shuddhi. A Samskara or Vasana means- for instance, if you took a piece of sandalwood and you keep it in a box. Even after removing the sandalwood for the box, for several days the fragrance remains in the box. So the event is over but the effect of it still remains. Samskara Shuddhi is that mystical process where the person is thoroughly cleansed of all the negative impressions that are there within him in his life. He is also cleansed of certain kinds of karma that are hindrance to his enlightenment. Then there is an intense period of meditation and then there is a time where he goes into the sutras or the essential teachings of Bhagavan where people begin to get tremendous insights. We have these retreats monthly for the Indians and for the rest of the world we have like every year retreats for people from one particular location. People come from North America, South America, Russia, Sweden, and other countries too. We are also planning soon to do individual work on the people who do not come during the mass retreats but are seekers that are selected and sent. There are the dasas who will work on them and take them through certain process and finally Bhagavan gives them this state of enlightenment. So do individually and in mass also. Q11. So now since it is required only for 60,000 people to be here, what is the criteria or attitude necessary for the seekers to participate? Ans. Basically we do not want to have any non-serious people to be here. We would like to have all those people that are serious about their enlightenment and their enlightenment for helping man. Any body who is open to his fellow human beings suffering, any body who can see the way the world is going to and any body who is even little sensitive in their heart and any body who ask the question- what do I do for man, how can I help him. Any body that is serious about this, any body that wants to help the world by helping himself is welcome to the retreat here. That is the first and most important pre-requisite before any body come down here and go through this process. Q12. Now we are all working for this to happen but what would happen if we all remain like this and this enlightenment doesn’t happen? Ans. My first experience is that when I conducted my first mukthi yagna enlightenment happened to 30 people and the next yagna that I conducted it happened to 35 people. We made a dint in human Consciousness that every person that makes it, it would be easier and easier for man. I hope that the possibility does not arise, but if mankind does not make it, it’s going to be terrible. We are not here prophesying the doomsday but what is in stored for man is evident. The way man’s thoughts & emotions are structured today; we must know man and nature are one organism and not two separate entities. The ruthlessness, selfishness & brutality we have within us, the amount of violence that is there in our every day life, all this is effected in the nature around us and very soon if man would go the way he is going, the tension he is building up because of the speed, competition and the struggle for survival, we seem to be moving towards inner death if we are not yet already. And if this is what is going to happen then we are going to have severe natural calamities. Mankind is going to have lot of diseases invaded because if the disease is inside that is going to manifest outside. Each one of us should only think, pause and look how am I living and we will know how we are going to be a few years from now, a few months from now. The speed at which the world is moving- what is going to happen to man? And lots of people are going to go INSANE. We can already see it happening. Many families we see, at least 2 people are insane or those who are managing to be sane. They are struggling to keep up their sanity. The world is moving towards disaster. If the pollution is going to increase because the kind of civilization we are in is the product of our mind and greed, then thousands are going to die out of lung diseases. A large section of human population is going to be wiped out. That is what is in stored for man. It is not that the earth is going to become a dead planet and human race is going to be wiped out, no, but then lots and lots of people are going to die and those who are going to be left behind are going to be living is a huge graveyard and it is not a pleasant experience. Its time that one becomes serious about life, serious about ourselves, serious about our fellow human beings, serious about suffering around us. We got the gift of thinking, feeling, we can’t be dreaming and selfish any more. We have to buckle up. I hope & pray that we can come across 60,000 serious people. I now that they are definitely there. If this is not going to happen by the time it is 2010 then we are in for a crises. Mother earth is going to revolve. She is not going to take it on any more. The house is burning already we can’t wait any more. Today in India we can see, there is drought and to such places one of our enlightened dasas go, sit down and go into a deep state of love & compassion then it rains. Earth is aching and seeking for enlightened people. That’s what has to happen now. If all goes well and 60,000 people are enlightened then we make it. We also have got certain energy spots where we are going to build our Golden City. This is the spot where the magnetic grid lines are working differently. The Vaastu of an ancient science of geo bio energy is tremendous in the spot. And it is here that Bhagavan has impregnated his Consciousness into that land. All that we need is 60,000 people becoming enlightened and 5000 people in their enlightened state living in this place and meditating for mankind. It is not that these 5000 people have to be the same people. If at any given point of time out of 60,000 people for one month 5000 people decided to spend in meditation over there. Then over the next 1000 years of time things will be different. The rest 55,000 who are outside are going to have so much power that is going to flow through them that as they touch, look and go into them selves others will be enlightened. That is what we are aiming for and our plan for the future. If man does become enlightened by 2010, then by the time it is 2024 there is going to be a different technology on this planet. We are going to have enlightened doctors, engineers, officers, peasants, housewives, mothers, children, all living, dreaming, and experiencing love. That is what is stored for man if he is going to be enlightened. Then 1000 years from now man we are going to see a different species. Man is no more going to be the same. We have had different kinds of species emerging on this planet. We have the Neanderthal man, the Rama pithacaus, the astralo pithacaus and now it is homo sapiens- sapiens. The species that is going to emerge 1000 years later is not going to be humans but a different species. A species that won’t eat food and can draw energy directly from nature, a species that is neither male nor female, a species that would not have this circuit in the brain to suffer, this soft ware called suffering would be destroyed once and for all. It’ll be a species that is living in bliss that can go from this plane into another plane and travel astrally at will. A species that is no more chained & bound by the physical frame. This is the kind of species that is going to emerge 1000 years from now, if only man is enlightened and it is for this purpose Bhagavan is here right now. Q13. If mankind has to be enlightened isn’t it the Golden age or the satya yuga? It is said that we are in the Dark Age or the kali yuga? Can you explain? Ans. How long the Iron Age is going to last and when the golden age begins is determined by the movement of the earth on its orbit. When the star Mulam radiates its complete energy and the earth is at that point where it completely access this cosmic energy then we say it is Satya Yuga. The question is not one of speculation as to when Satya Yuga is going to come, whether it is going to be 1000 of years later, millions of years later. To put it simple let me tell you this—For instance you go to a doctor and the doctor tells you that your disease is going to be cured within 3 years time. You are very disappointed and sad because you are not sure if you are going to survive and tolerate the pain and live for 3 years. You go to another doctor and he says- Look it is not going to be 3 years, I am going to cure it within 3 months. Are you going to be unhappy about it and tell may be I will rather wait for 3 years? If the doctor were to show it to you that it is indeed possible to cure it in 3 months, then you would say I feel it now. I think at this point of time speculation is a waste of energy. All that we have to do is observe and see what is happening right now. Mankind definitely cannot last for the next 300,000 or 400,000 years with the kinds of minds they got, with the kinds of thoughts they got, and the kind of suffering they got. I think a few years later if mankind would go the way it is going, this planet will be inhabited by mad people who cannot take on the stress, insecurity any more. Bhagavan is today saying that the Golden age is going to be ushered within the next 12 years, Man kind is going to be enlightened and by the time it is 2025 you are going to see a different world, then it is for you to judge & see whether it is golden age or iron age. Speculation is of no use here. Lets go through the process, become enlightened and then see what the world looks like. Regards to the question whether it is the Dark Age or the golden age that’s currently going on, I would say it is the period of twilight where the darkness is fading out and sunlight is streaming in. Now kali Yuga is ending and Satya Yuga is beginning. It will definitely take next 12 years for it to come in and becomes very profound until 2025, and for it to complete it will take 1000 years from now. According to us this is Satya Yuga. The moment Bhagavan began to give this state to man it is Satya Yuga. Thank you Dasaji for giving your valuable time and sharing with all of us this wonderful message and your vision & perspective about helping Mankind.